HCL’s CEO Anant Gupta has resigned to ‘pursue interests outside of HCL.’ The company has elevated current Chief Operating Officer C Vijayakumar to the post. Anant Gupta, 51, had began his career with HCL in 1993 and has held a series of leadership positions in the company. He’d beomce the CEO of the company in 2013. He is also the author of ‘The Blackbook on the Remote Infrastructure Management (RIM) Industry – Demystifying the third wave of Outsourcing’. Hours after HCL announced his resignation, Anant Gupta announced he was starting a Rs. 100 crore startup fund, TECHCELX. The fund will be an integrated business acceleration and technology investment firm focused on developing digital technology products & platforms in enterprises. The firm will aim at filling the innovation gap in established as well as emerging companies in India, according to a statement. “With TECHCELX I am pursuing my long term goals and passion towards promoting our country’s entrepreneurship and innovation potential in the technology space,” said ​ Gupta, who’s the Founder and Chairman of the firm. The fund will focus on ventures in Machine Learning, IoT, AI, Analytics and Data Science and Automation across three main sectors of Banking, Education and Healthcare. The company will invest between Rs 50 lakh and Rs 10 crore in disruptive technology ventures and the share holding will range between 15% and 51%. His replacement, C Vijayakumar, 49, is an electrical and electronics engineer. He joined HCL Technologies in 1994 and has been instrumental in pioneering the RIM proposition, which has become a hallmark in the industry. He is known for his leadership style and deep connect with the teams and customers. He is married and has one daughter. In his free time, he likes to listen to classical music and read books. “Vijay has been a transformational leader in the company leading from the front. His vision and flawless execution track record best positions him for taking our journey forward,” HCL Technologies Chairman and Chief Strategy Officer Shiv Nadar said. Vijaykumar will continue to be based out of the US in his new role. HCL Technologies today reported better-than-estimated net profit for the July-September quarter, leading to a 4 per cent jump in its shares. 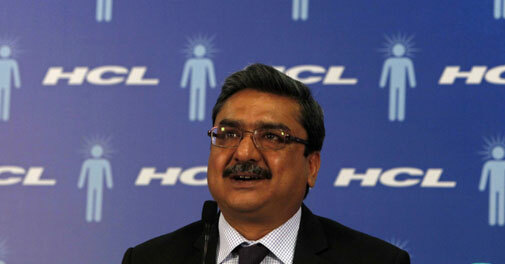 HCL, which is India’s fourth largest IT services company, posted a net profit of Rs. 2,016 crore on sales of Rs. 11,519 crore.